One cannot spend but a moment with Andrea Gates and not walk away happier and ready to do something great—like climb a mountain or something! Her endless energy, positive outlook and dedication are hard to match. 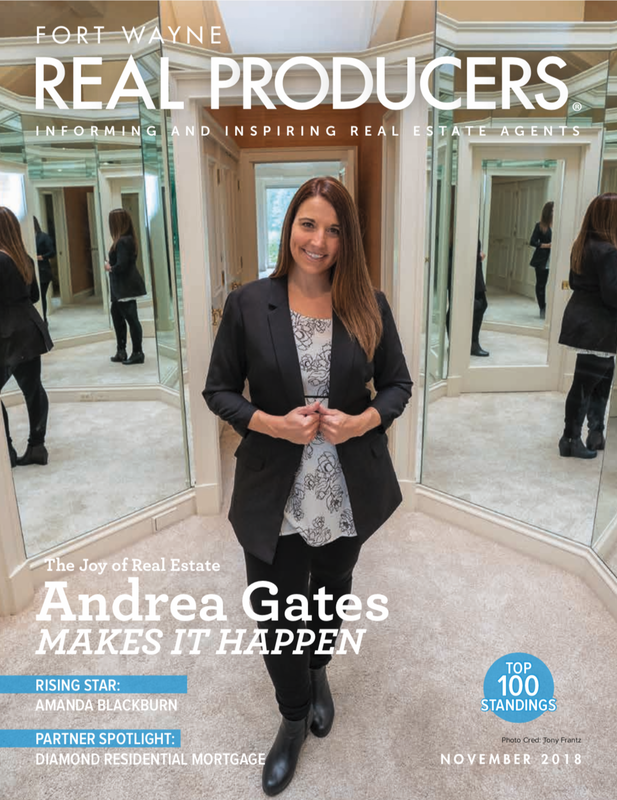 With sales last year over $8 million, Gates is poised to make an impact on real estate sales for years to come. Andrea finished her post-secondary degree at Ball State University, having studied Telecommunications and Marketing. Two internships at a radio station in Fort Wayne (HOT 107.9) prepared her for her first job at the station selling advertising. Later acquisitions by the station opened the door for her to sell for two other radio stations as well. After a few years, Gates switched industries and began selling advertising for a local newspaper. She had the opportunity to meet and work with many REALTORS and Brokers along the way. In time, Andrea developed an interest in real estate sales, finding it captivating and intriguing. She thought that she could do the work and would love doing the work, so she obtained her license in January of 2011. 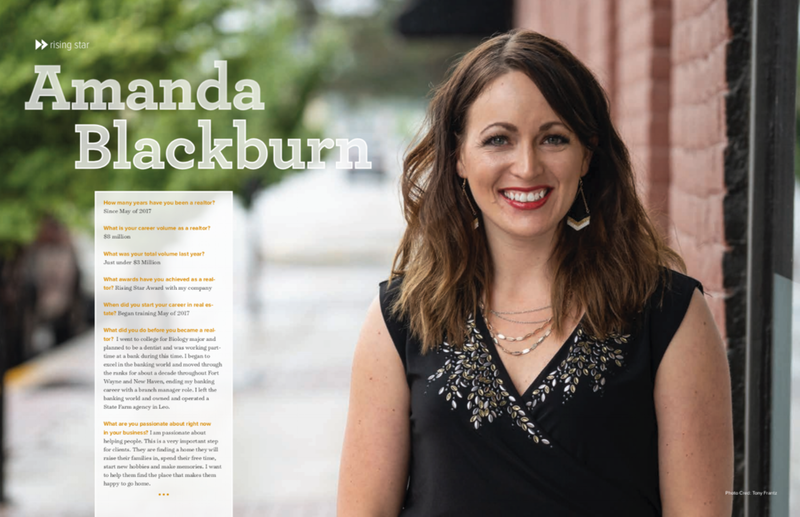 She kept working full-time while attending classes for the license, but after her first closing she took the plunge into full-time real estate sales. Andrea quickly learned to love her new career. She heard everyone say that agents have a lot of flexibility, but she struggled with that in the beginning. She knows now that it exists and is learning to make her non-scheduled time adjustable. She loves the fact that there is freedom and enjoys helping people with their biggest purchase. Gates has enjoyed becoming life-long friends with many clients, and she appreciates sharing in their achievements and joys along the way. Andrea defines success as doing something that proceeds from your giftedness that makes you happy. Of course, making a more than comfortable living at it is a definite bonus. She describes herself currently as happy, successful and fulfilled. “I told my husband the other day; I love our life,” she gleefully shares. Gates has been married for about a year and one-half. The couple just celebrated the birth of their daughter, Callie. Her husband, Nick, works as a Sales Manager for the Kelley Automotive Group. They love to travel to the lake or to his home state of Florida. Recently, Andrea even helped her father build a home in northern Indiana. She has a fascination with animals, and if she could, she would work with them—particularly endangered species. For those who may consider selling real estate, Andrea has some sage advice. She tells them to build up a good savings account, as the early days are lean. She also challenges them to be dedicated, disciplined and patient. She says that they must develop a commitment to lifelong learning and to be never-ending in positivity. That is not surprising to hear her say that, as she is one of the most positive and energetic people to meet. Going forward, Andrea Gates wants to build her team and help others grow their own business. “We can grow together,” she explains. Gates will continue to surround herself with focused and purposeful people who bring happiness into their work. She notes that while some people make selling real estate look easy, it is a work that is clearly achieved by determined effort. That is okay with her, and she finds incredible joy in doing it every day. It is just who she is and what she does. How many years have you been a realtor? What is your career volume as a realtor? What was your total volume last year? What awards have you achieved as a realtor? Rising Star Award with my company. Began training May of 2017. I went to college for Biology major and planned to be a dentist and was working part-time at a bank during this time. I began to excel in the banking world and moved through the ranks for about a decade throughout Fort Wayne and New Haven, ending my banking career with a branch manager role. I left the banking world and owned and operated a State Farm agency in Leo. I am passionate about helping people. This is a very important step for clients. They are finding a home they will raise their families in, spend their free time, start new hobbies and make memories. I want to help them find the place that makes them happy to go home. What has been the most rewarding part of your business? Knowing that I made a difference in someone’s life, no matter how small or how big. Some clients never thought they could own their own home or that the tasks were too big. I am not afraid of a challenge and find them to be the most rewarding experiences. What was your biggest challenge as a realtor? As with any new Realtor, lead generation is the most difficult challenge. I have no repeat business at this point in my career, everything I am generating is from scratch. My brokers helped me find a way to begin systems and processes to aid me in growing my business from the very beginning which has helped me continuously grow. How does real estate fit into your dreams and goals? I had always had a draw to real estate since I was in college. I bought my first home at 21. With starting a family young, this career had always been put on the back burner. Finally making it here and it being the right time for my family and I is very fulfilling. I am an entrepreneur by nature and wanted to find a career that gave me the opportunity to grow, be myself and help others achieve their dreams. What’s your favorite part of being a realtor? I have many favorite parts of this career. As a realtor, no day is exactly the same as the day before. There is always a new challenge or obstacle to figure out how to overcome to keep together or bring together a buyer and a seller. Success is nothing more than finding happiness. It’s not chasing a paycheck or material objects. Finding what makes you happy will change your world. My husband and I met in high school when we both worked for a grocery store. We were married in college and decided to start our family shortly after. My husband works for B.F. Goodrich. We have two sweet, rowdy and crazy boys. Evan, our oldest, is in 1st grade at Lafayette Meadows and Jackson, our youngest is in preschool at Central Lutheran. We recently moved out to Roanoke to enjoy the country views. Appreciation Marketing was a book I read that helped me understand the difference between just marketing to my clients versus showing I cared about them, The Slight Edge showed me how to take that extra little step each day would help grow your business over time and Takin’ Care of Business was recommended by my mentor and helped outline what to focus on and how to think as a business owner. Are there any charities or organizations you support? I have been active throughout the years with several organizations: New Haven Chamber, Grabill Chamber, Leo Community Foundation, Christian Community Healthcare Clinic, Allen County Angels, and Junior Achievement. What are your hobbies and interests outside of the business? As a working mom with two young children, my husband and I don’t have a lot of time for hobbies. I would say that one day I would like to find a way to get back into vocal music as it has always been a passion of mine. Given your status and expertise, what is some advice you would give the up and coming top producer? Don’t give up. Find a company or a mento who will coach you through the tough times. Pushing yourself forward can be hard but always keep a positive outlook on things and know that God will always be there to help you through when you ask. Take the extra appointment, say yes to new opportunities without experience because that is the best way to learn—don’t fear the unknown, instead embrace it! In closing, is there anything else you would like to communicate using this Fort Wayne Real Producer platform? Thank you Real Producers for this honor and recognitions. Also, thank you to my brokers, Corey and Melissa Malcolm, and my mentor, Kelly Oswalt, for always being there to help me put out the fires and teaching me how to do what is best for my client and how to run my business the in right direction. I would not have started off nearly as strong as I have without them. Also, thank you to all of my wonderful clients, friends, and family for your referrals as your support means so much to me. Also, the biggest thank you to my husband and other family members who have helped out so much with my long and crazy hours—I love you so much! And of course, all things are possible through God if you just trust he is leading you through.